Shooting drills for soccer will improve improve the players shooting ability. Repeated shots, and the right technique lead to kicking the soccer ball with power and accuracy. Taking as many shots as possible is the best way to develop, and improve shooting through repetition. It takes a lot of hard work, and many repeated shots on the ball to develop the shooting skill with the correct technique, and the right timing. Great way to let the game teach you shooting is by using a wall, garage, or a rebound goal. Dont use power, instead concentrate on the technique; making firm contact on the ball, ankle locked, eyes on the ball, body coming over the ball and striking through the ball, back and forth off the wall, garage, or rebound goal. Playing indoor soccer, futsal, or street soccer will help players get more shot attempts due to the nature of the game being more fast paced with less players, and smaller space. Small sided games are the roots of every great soccer player in the world. Soccer shooting drills improve shooting skills due to repetition, and muscle memory. Being consistent with training makes our brain memorize the motion, including the position of the body, so that we can perform from muscle memory during the games. Conditioning, or the level of fitness, plays a big role for players ability to shoot, pass, defend, or think in a fast paced competitive game. Check out Soccer Shooting Technique for more information on technique. 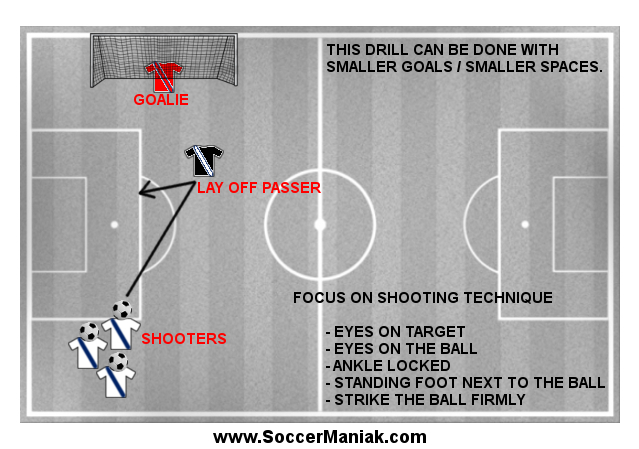 This shooting soccer drill can be done with small pug goals, and smaller space with or without the goalie. Players will take many shots, with time to concentrate on their contact with the ball, with minimal, or no defending around. Concentrate on the right shooting technique, instead of going for power. Over time, repetition will form into a habit, and power added to a trained technique will lead to much better shooting skills. Firmly hit the soccer ball while keeping your eyes on the ball, forcing your body to cover the ball and follow through with a nice firm contact with the ball. A coach, or one of the players will take a position in front of the goal, at a distance comfortable for players age and shooting ability. The rest of the players will take one soccer ball each, and line up further up the field (again depending on the age and skill of the players). Player with the ball makes a pass forward to the player in front of the goal. Player will follow his/her pass, and shoot the ball from the lay off pass made by the player in front of the goal. Player/Coach laying off the pass can pass the ball back on the ground, or in midair. Players will want to use both feet when taking shots. Before taking shots, look at the target, and where you want to kick the soccer ball. Modify this soccer shooting drill with a defender. He/she will have a delayed start behind the player shooting the ball. When the player with the ball takes off, defender will wait for a 5 m/yd advantage, and try to catch up and block the shot. Limit touches to 1, 2, or 3 touches on the ball. This will give players time to set up for a shot. Work on lifting the ball up for a volley or a shot off the settled ball. Get creative with the game and training.